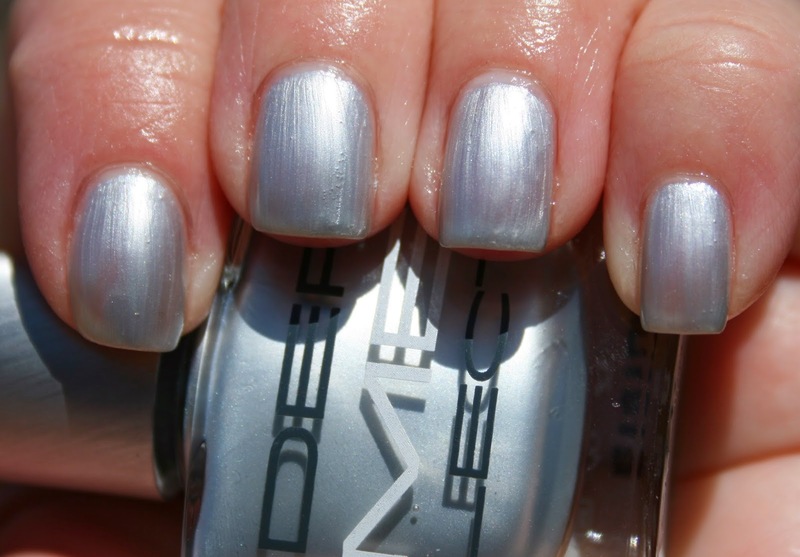 Dermelect describes this shade as "metallic grey- ridges of grey matter derived from the oceanic crust". I am afraid the word "ridges" is definitely well-used in the title..... this color left so many brushstrokes, it looks like ridges! I really tried to like this one. I actually did three separate manis, on three separate days, to try to get this one to work. Sadly, I just wasn't pleased with it. Although the mani pictured above would have been improved by a third coat, I could already tell after just 2 that the brushstrokes would be too much. Luckily, this was the one shade in this collection that gave me any problems. The rest I loved. Dermelect's Spring/Summer Revival 2014 Collection features seven new hues inspired by a renewed sense of woman’s self. Dermelect’s ME Revival collection, available March 2014, retails between $14.00-$16.00 and can be purchased at Ulta Stores nationwide, www.ulta.com, www.dermelect.com and at high-end apothecaries, beauty boutiques, salons, spas, medi-spas and doctors offices.